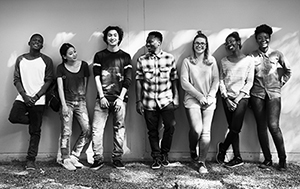 by Jean Lehn Epp, Interim Coordinator of Youth Ministry Resources - We assume that youth like to hang out in groups and that a group of youth are automatically a community. If you look more closely you might actually see smaller relational groupings that don’t necessarily know how to interact with other youth. Building community within a youth group takes work and it doesn’t happen automatically. In our current postmodern climate, with the deconstruction of so many pieces of our church culture, community is one of those elements that should be recovered and reinvented in new ways. Youth are surrounded by broken relationships, divorce, separation and short-term relationships. What they need from the church are experiences of being in community amidst differences of opinions, theology, personalities and preferences. We need to be surrounding our youth with opportunities to go deeper and learn to develop long lasting relationships. As churches we should be about building community that goes beyond a social club of insiders. Our focus should be on building community with youth that is open, invitational and fosters real and authentic relationships. Community is formed when we intentionally journey together through difficult topics, shared experiences and worship God together. Building community is not limited to the gathered church on Sunday morning. Your online church community is like the new front door that shouldn’t be exclusively virtual but should transition into real, human connections. Facilitate guided conversations with a few adults and the youth about issues they care about like the environment, sexuality, inclusivity, technology, relationships, poverty, social justice, etc. Immerse the youth in the community around your church. Go for a prayer walk in the neighbourhood, learn about the history, hear stories from formative people in the community, explore particular issues that are unique to the area, volunteer at the local seniors’ centre or adopt an area for garbage pickup. Do some interactive games that encourage taking turns talking and listening. Build mixing into the activity so those who wouldn’t normally interact with each other get a chance to do so. Revive the lost art of hospitality through progressive meals that have the youth being hosted by different people in the church or have the youth host a group of their choice. Be intentional about facilitating conversation like having a different question to discuss at each location or for each course of the meal. Create some school kits or relief kits for Mennonite Central Committee. Plan a list of items needed and go shopping together for the items. Have a competition to see how many kits the rest of the church will sponsor. Have a giant assembly line to put the kits together and give a prayer of blessing for them at the end or in worship on Sunday morning. Breathe new life into your mentor program or start one. Match a youth with an adult in the church. Be sure to create guidelines that respect your safe church policy and are realistic for busy youth and adults. Bruxy Cavey and The Meeting House church have compiled ideas on practicing talking about faith as well as small group discussion ideas. They have also developed multimedia curriculum with a brief Biblical teaching and discussion starters for both junior youth and senior youth. A subscription to the curriculum can be arranged with The Meeting House. Jolene Roehlkepartain has brought together a collection of interactive group activities and worksheets to encourage youth to explore their gifts and build community together. In her book, Building Assets Together: 101 Group Activities for Helping Youth Succeed, youth are invited to express their hopes and dreams as well as share about what is important to them. Need ideas on how to get conversations started on challenging topics? Directed to enhancing conversations with teens and adults, Bridges: 15 Sessions to Connect Teenagers and Adults is the result of the work of Mark DeVries and Nan Russell. This resource is a great asset for family based ministry that encourages discipleship with a mix of age groups as they learn and grow together. A collaborative effort from Jim Candy, Brad Griffin and Kara Powell, Can I Ask That? Volume 2: More Hard Questions about God & Faith gives leaders the tools to facilitate conversations that take youth to new levels. This resource encourages leaders to dive into difficult topics that the church is called to engage with youth in faithful ways. The accompanying student guide, Can I Ask That? Student Guide, supports these six sessions. Try some interactive games to encourage practicing talking and listening. Jumpstarters: 100 Games to Spark Discussions, is a great resource to aid in breaking the ice with intentionality. This resource is not afraid to tackle difficult topics in very fun and interactive ways.